According to the Sacramento Bee, Solomon died at home on Sunday night while watching last night's Academy Awards. His son, Michael Solomon, told the paper "Ironically, he was giving his opinion of what someone was wearing that he thought was ugly, then asked (his wife) Patti to to refill his whisky." By the time she returned, he had passed away. Born in Sacramento, CA, he worked at his fathers Tower Cut Rate Drug Store before being thrown out of high school for lack of attendance. At the age of 16, he started selling used jukebox records out of the store before entering the military for World War II. In the early-50's, Solomon opened his own record distribution company but, by 1960, he was forced to close because of lagging sales. Almost immediately after, he borrowed $5,000 from his father and started MTS, Inc., opening his first store. 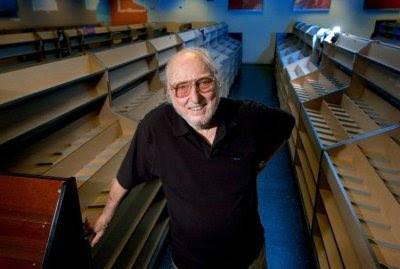 In 1968, he opened his first Tower Records in San Francisco in a 5,000 square foot space. Two years later, he expanded to Los Angeles and, before the 70's was over, had opened 26 more locations. His basic business belief was to open the biggest stores possible and pack it with as much product as would fit. At one point, the Tower Records chain was selling $1 billion per year. Continuing to expand in the 80's, Solomon took on more debt to fuel the growth until he finally reached the point where profits from all the stores were not enough to serve the debt. The Tower Records chain went out of business in 2006 but Solomon continued, opening R5 Records in L.A. even though the digital download revolution was killing the physical music business.Three years later, he ended up selling the store off. In 2015, actor Colin Hanks directed a documentary on Solomon's life, All Things Must Pass: The Rise and Fall of Tower Records.